I realized today that this sweater is probably supposed to be worn flopped over above the ribbed hem. It looks better on me this way at least. I like how it has a slight Edwardian or ’20s look to it flopped over...or maybe I’m imagining that, but anyway, I think it’s kind of a nice relaxed effect. Are you sick of this green skirt yet? I wonder how many times I’ve worn it. Probably 100 by now. My friend owns it and I'm sad that I never went to get one too. The little pearls are so sweet. It looks lovely on you exactly as you're wearing it. No - love the green skirt. It matches the color I put in my dressing room (you should check it out - I just posted pics). That shade of green is so elegant! I will never tire of this skirt. 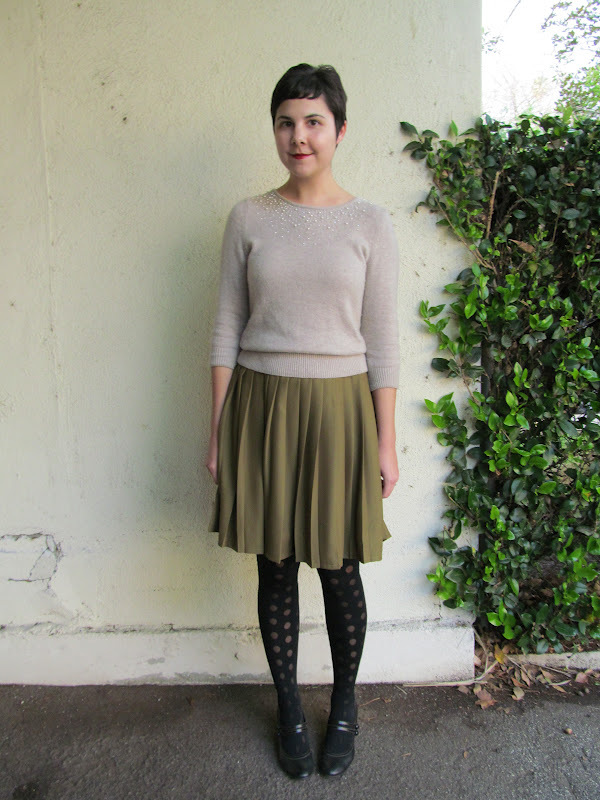 You always pair it with interesting pieces from cute sweaters to pretty tights. Love the sweater exactly how you're wearing...the pearls are darling. Your green pleated skirt is so great. I love the sweater with the pretty detailing on it too. I LOVE that skirt! It's such a great color and it flows so nicely and it's such a great length!!! Never! It's such a beautiful shade of green. I keep hoping I'll come across something similar one day. Darling sweater, too.